Humans are dead men walking. We're survivors. An we'll do anything it takes to keep it that way. Dead of Winter: Warring Colonies expands both Dead of Winter and Dead of Winter: The Long Night with new survivors, items, crossroads cards, and crisis cards. Additionally, if you own all three, play the new epic colony vs colony variant for 4-11 players! Engage in high intensity battles over resources and territory! Race against time with new simultaneous play mechanics! Play as the Lone Wolf, loyal to none and driven by your own secret motives! Not a stand-alone game. Either Dead of Winter or Dead of Winter: The Long Night is required to play a standard game. 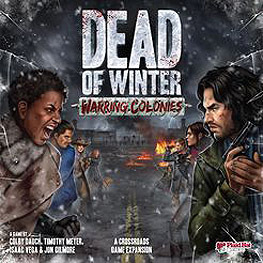 Both Dead of Winter and Dead of Winter: The Long Night are required to play the Warring Colonies variant.